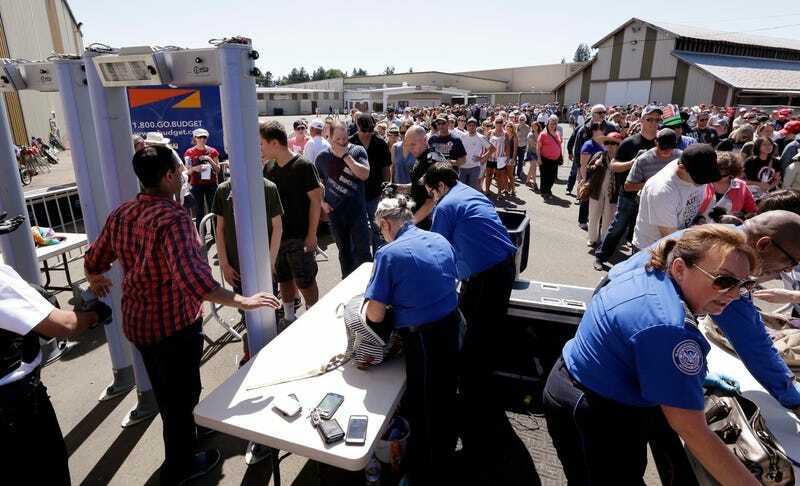 Why Are So Many TSA Agents Working Political Rallies? When the Secret Service needs help running security for a political event they turn to the TSA. But with TSA staff shortages and absurdly long lines at American airports, why is the Secret Service leaning on the TSA for help? New figures obtained by Gizmodo lead us to believe that American flyers are in for a very long summer. In the latest figures provided to Gizmodo, we see a staggering number of TSA agents being temporarily reassigned to non-transportation related activity over the past two months. In April and May the US Secret Service asked for over 1,520 TSA agents to assist at various campaign events for Donald Trump, Hillary Clinton, and Bernie Sanders. But a TSA spokesperson says that they’re not concerned. Senator Sanders has been the largest beneficiary, with roughly 755 TSA agents present at his rallies. Mr. Trump has had the second largest TSA presence in the past two months, with 587 agents assisting the Secret Service. Secretary Clinton is in a distant third, with 178 TSA agents at her events since the beginning of April. There are a number of different ways to speculate about the discrepancy, the most obvious being that Sanders and Trump have both turned out enormous crowds compared with Secretary Clinton. There’s also the possibility that Clinton’s Secret Service team is more experienced (she has had Secret Service protection since the 1990s, after all) and hasn’t bungled the logistics of large events. According to a source at the TSA who wasn’t authorized to speak on the record, the agency continues to insist that their work with the Secret Service hasn’t contributed to longer lines at airports. But that’s tremendously hard to believe given the reality on the ground. Sure, you might miss your flight this summer after waiting in line for three hours—the highlight of which is getting your balls ever so violently twiddled as an underpaid man in blue gloves checks you for explosive pleats. But you can take solace in the knowledge that at least people attending Trump rallies are getting the same treatment.